A part of the CUHSD Strategic Plan is to make our schools a place where students are safe, supported and valued. 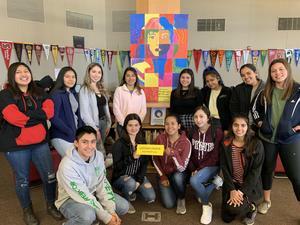 This year 20 Westmont students established the Latinos Unidos Club to support that mission by providing Latino students with a sense of community and belonging. “We are all devoted to spreadingLatino culture throughout the Westmont community along with ensuring every Latino student feels welcomed and encouraged to be part of that community,” said Latinos Unidos Club President Xiomara Portillo Pineda. Students brainstormed ideas on how to further engage the Latino community through focus groups with site and district office administration. “Expressing our opinions to someone that is genuinely interested helps make a change in the community,” said Pineda. Westmont Principal Jason Miller says the club has had a positive impact on the school community and culture. “The Latinos Unidos club built a space for all students to come together in celebration of Latino culture while creating a culture of inclusivity and awareness,” said Miller.